Erin Zolner and Amy Nichols, owners of The Lollicake Queen, eschew the term "gluten-free" and say "no-gluten" instead. And Nichols notes, "We're not a gluten-free bakery." Ah, but don't think they don't offer a stellar selection of sweet, scrumptious, zero-gluten treats. Start with "chocolate decadence," a rich, flourless mini-cake drenched in dark chocolate ganache. Then bite into their "Satisfaction Bar," their house-made version of a sans-gluten Snickers bar. 1821 Hillview St., Sarasota, (941) 955-8101. At Veg — A Vegetarian & Seafood Eatery, brown lentil rice, sweet potatoes and gluten-free bread and crackers can be turned into sidekicks for any entrée. Owner Maggie Glucklich's favorite gluten-free entrée is the "Portabella Volcano." Envision a marinated portabella with garlicky mashed potatoes on a bed of sautéed spinach and quinoa with seasonal veggies. 2164 Gulf Gate Drive, Sarasota, (941) 312-6424. You don't have to take the gluten out if they never put it in. Denise May, co-owner of Chutneys, Etc., explains, "Indian cuisine is traditionally gluten-free." As for Chutney's Middle Eastern and Greek specialties, she's always seeking creative alternatives. Case in point: Chutney's reinvention of the classic Greek pastitsio, a pasta and meat casserole. May's version uses gluten-free rice pasta. Nice! 1944 Hillview St., Sarasota, (941) 954-4444. "Yes, we have no gluten" is the unofficial motto at Island Gluten-Free Bakery. No wheat, barley, rye, bulgur, durum, kamut, semolina, spelt, triticale or any other grains, flours or ingredients banned by the Gluten Intolerance Group and/or Celiac Sprue Association. Instead, Karen, Vickie and Kim, the three sisters who own the bakery, offer a bewitching batch of daily-baked breads, muffins, scones, cookies, cakes, pies—and pizza crusts. Many treats are also dairy-free and vegan. 1880 Stickney Point Road, Sarasota, (941) 923-0200. At Ionie Raw Food Café, the gluten-free lasagna would make your Italian nonna smile. They whip it up with healthy layers of zucchini, pasta, marinara, macadamia nut cheese, spinach and basil pesto. For more smiles, try the pizzas with crust created from sprouted buckwheat, carrot and flax and topped with nut cheese, special "sausage" and whatever greens and herbs your heart desires. 1241 Fruitville Road, Sarasota, (941) 955-4599. There's nothing you love more than a nice, tall stack of pancakes—and nothing you love less than gluten. Fortunately, The Table Creekside's creative chefs have come to the rescue. Their quinoa pancakes with guava butter and banana compote greet your senses with all the happy smells and flavors of childhood. Thanks to a gluten-free, edible seed called quinoa, a delicious, nutritious, protein-rich superfood, folks on a gluten-free regime can have their pancakes and eat them, too. Served only during Sunday brunch through May. 5365 S. Tamiami Trail, Sarasota, (941) 921-9465. Taste of Asia includes abundant gluten-free tastes of Asia. (Just look for that "GF" and you're good to go.) Our personal faves? Try any of the Thai coconut curry dishes (the "Amazing" is amazing with homemade peanut sauce), jasmine rice creations or Vietnamese-style noodle soups concocted from rice noodles. Gluten won't be a problem in any of these dishes. Happen to be vegan, too? The menu has an entire section just for you. 4413 S. Tamiami Trail, Sarasota, (941) 923-2742. Gluten-free pizza: the final frontier. It's one thing to make it, another to make it delicious. At Cosimo's the crust is so tasty, it's hard to believe it's made from gluten-free yeast, millet, sorghum and tapioca flours. Cosimo's gluten-free menu boasts a galaxy of pasta dishes (including sun-dried tomato with vodka cream sauce), low-carb choices (the Tuscany Skillet is a sensory delight of oven-roasted vegetables, artichokes, onions, garlic, sun-dried tomatoes, pesto and Fontina cheese) and desserts. 5501 Palmer Crossing Circle, Sarasota, (941) 922-7999. Jamie Barrett of Simply Gourmet Catering can't eat gluten—or carbs, period. "So I adapt," she says, adding that hubby Larry has cooked up cunning strategies to cater to her dietary needs. They also cater to gluten-free guests at parties and events. A favorite is Larry's pandabono, a Columbian bread concocted from corn meal, yucca flour, eggs and queso fresco. "These little rolls are the perfect base for scallion cream, smoked salmon—even pork sliders!" she says. 4783 Swift Road, Sarasota, (941) 929-0066. When Sarasota resident Beverly Scott discovered she had celiac disease, she started creating tasty, gluten-free Italian foods—and passing her inventions on to others. 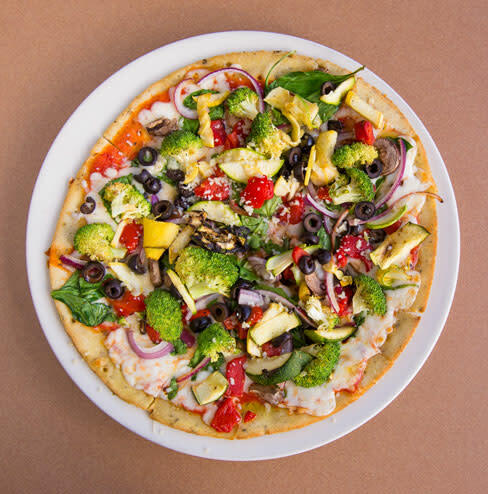 Her flatbreads, pizzas and lasagnas are all made with organic, gluten-free, whole grain flours and gourmet cheeses. For a taste of her "Beverly" flatbreads, check out Casa Italia. These taste-tempters are made with rice, millet, tapioca and arrowroot flours, par-baked and just begging for your own tasty toppings. They also carry Beverly's rice-based lasagna. 2080 Constitution Blvd., Sarasota, (941) 924-1179. Our 10 Best lists are not numbered in order of preference.